Here we go! 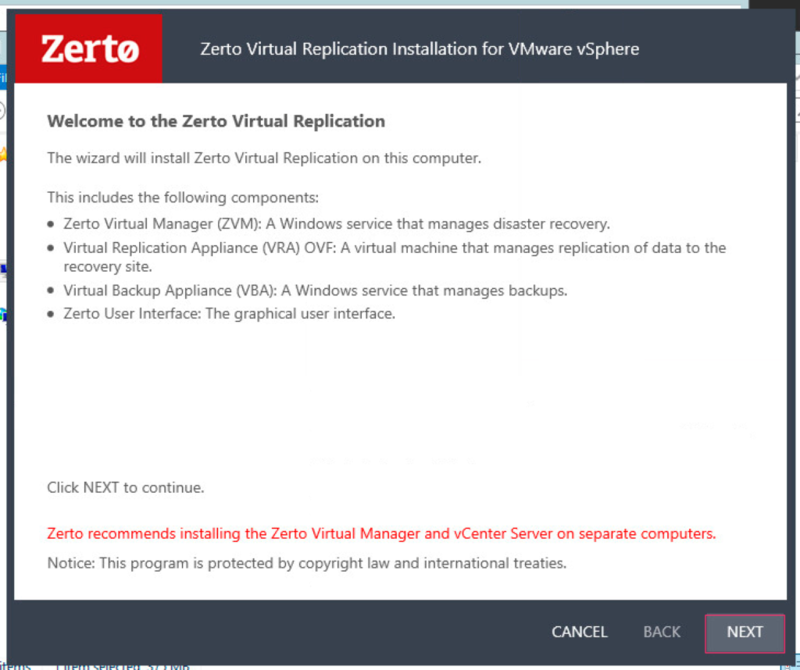 The following procedure is a step-by-step installation of Zerto Virtual Replication 4.5 U3. 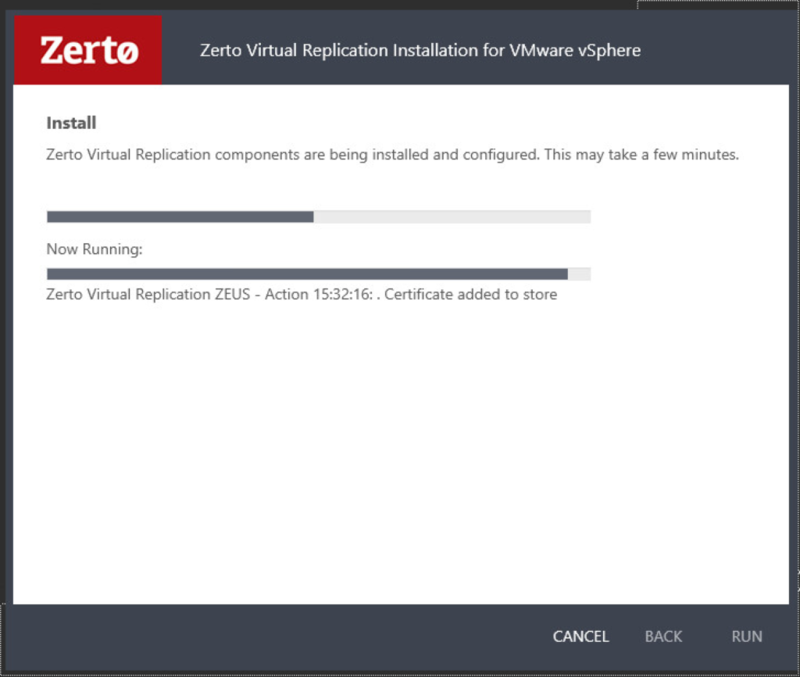 Before starting, you should have built 2 Windows VMs per the Zerto system requirements. If this is being done in production, be sure to size the servers as needed for the number of VMs you will be protecting. The version being installed is 4.5 U3. Note: Be aware of OS limitations when dealing with 32-bit vs 64-bit. In a 32-bit Windows Server installation, the maximum amount of RAM you can give the system (that it can actually use) is 4GB. If you’re using Windows Server 2008 R2 or Windows Server 2012, they’re only available in 64-bit, so you won’t need to worry about this limitation. For more information on Windows memory limitations, please see this. The account you log into the ZVM with and use to run the service will need to have administrative privileges in vCenter. It is recommended to use an NTP server for clock synchronization. One VRA should be installed per host in a participating cluster. By doing this, you are accounting for any vMotion or DRS activity related to any protected VM in the cluster(s). 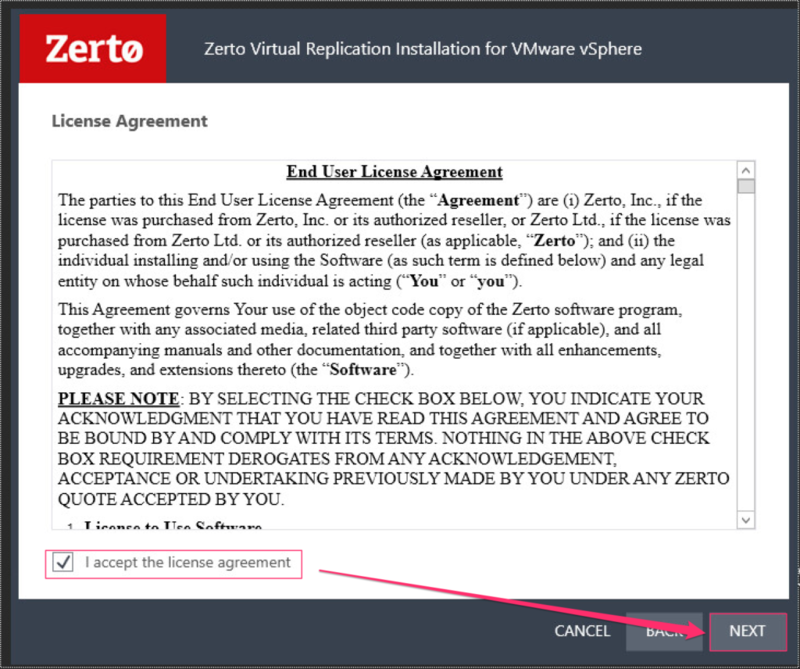 ZRAs are deployed from within the Zerto UI, and furthermore, when this is done, DRS affinity rules are automatically created for the ZRAs, and any reservations required are automatically created. Important: After deployment of the ZRAs, be sure to add the ZVM and ZRAs into a folder in vCenter that can be excluded from any snapshots. In otherwords, if you’re using VADP for backups, be sure to exclude this folder, or each ZRA/ZVM from within your backup software. Failing to do so will cause corruption and you will have to re-deploy the ZRAs. Furthermore, this will prevent any performance degradation that is a result of snapshot cleanup/consolidation jobs. Ports 22 and 443 open on each host during installation of the ZRA (During ZRA deployment, Zerto will also attempt to enable the SSH service on each host, however, if it fails, you will need to manually enable/disable). You’ll need to identify what datastore to install the ZRA to. ZRAs will automatically be named by Zerto during deployment, and clearly indicate what host they are running on. Once you’ve built your Windows VMs to house the ZVM, the steps below will guide you through the installation. This will need to be done in both sites, although, if you only have 1 site, you can still protect and recover within the same site. Please note that if you are installing in 2 geographically separated sites, you may need to open some firewall ports before pairing sites and initiating replication. For firewall requirements, see this document. 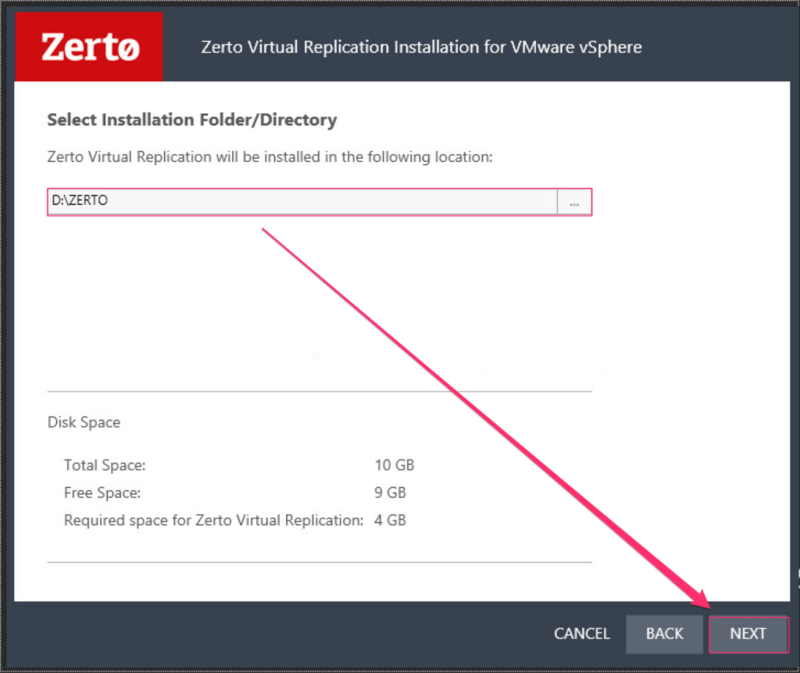 Browse to the directory where you have downloaded the installation files to and run the installer (Zerto Virtual Replication VMware Installer). Select the installation directory, and click Next. Select the installation type, and click Next. Select either “Local System Account” or “This Account” if you have a dedicated service account. Either way you decide to go, the account will require unrestricted access to the local resources on the ZVM. After you made your selection, click Next. In the Database Type dialog box, select your database type, and click Next.Notes: It is recommended to use an external SQL server when a site has more than 40 hosts that have VMs that need to be protected, and the site has more than 400 VMs that need to be protected. If you use Windows Authentication for the SQL server (external), then the creadentials in step 6 will be used. Enter the name of the vCenter along with the admin credentials that will be used to connect, then click Next. 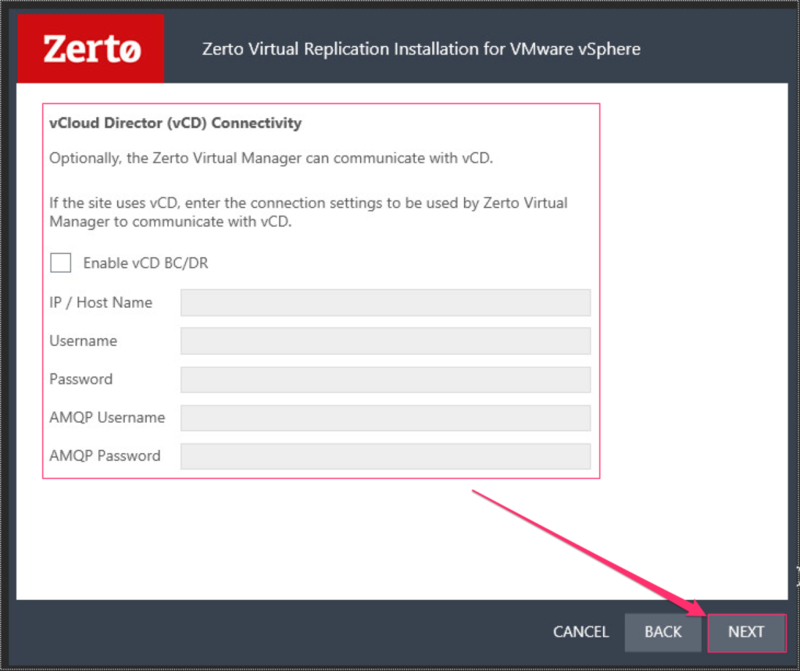 Optional: If you have vCloud Director and want to protect it using Zerto Virtual Replication, enter the information necessary to connect to it, and click Next; otherwise, leave the “Enable vCD BC/DR” box unchecked, and click Next. Enter the Zerto Virtual Manager settings to identify this installation, and click Next. Enter the required information for ZVM communication, and click Next. The ports listed below are defaults, and if you recover to a site managed by a Cloud Service Provider, be sure you do not change the default ports. 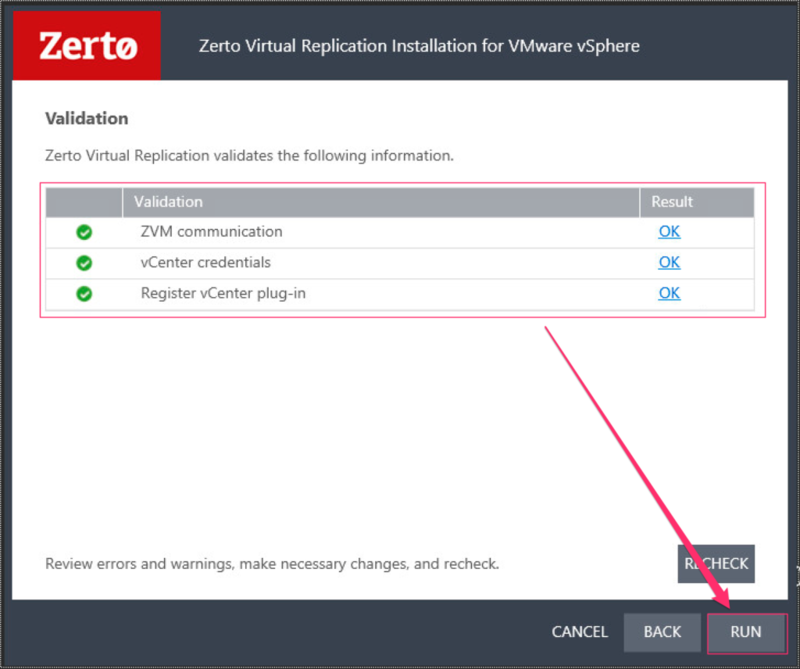 As soon as you click Next on the screen in the previous step, the installer will auto-validate ZVM communication to ensure the ports to this ZVM are opened, it will verify vCenter credentials that you specified, and will register the vCenter plug-in.If the validation for each item results in “OK”, click Run, otherwise, resolve any errors, and click Recheck. If you clicked Run, Zerto Virtual Replication will begin installation and the configuration of components. ← The Much Anticipated vSphere 6.5! 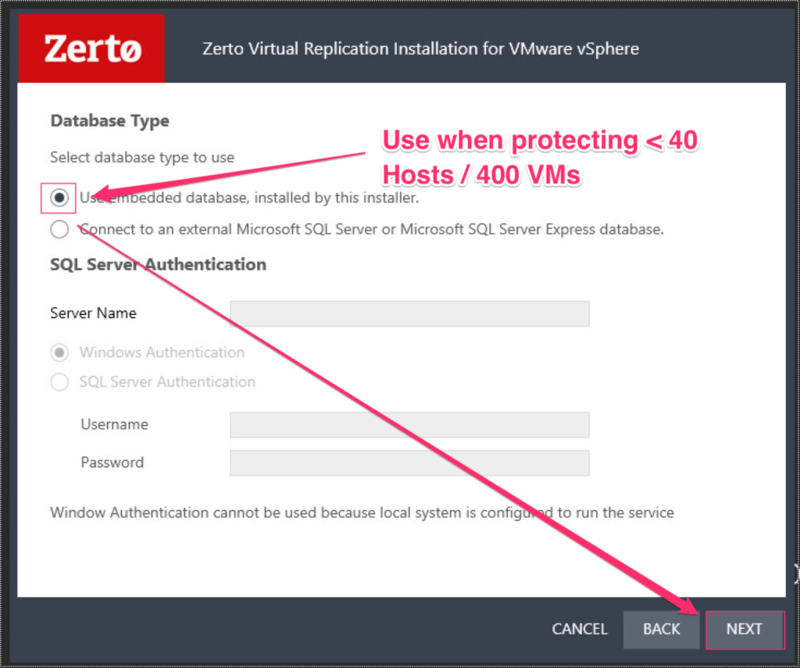 Zerto: Can Failover Live Be Used for a Datacenter Migration, Consolidation, or HW Refresh?